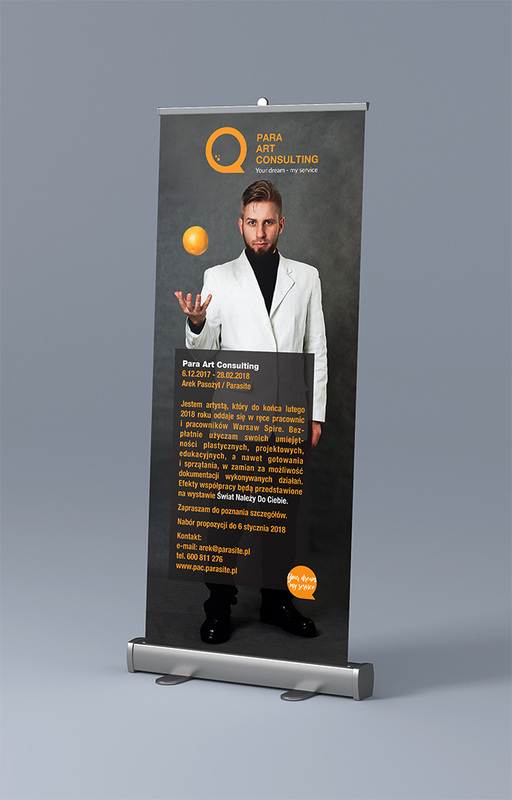 Para Art Consulting is an artistic project addressed to the employees of companies located in the Warsaw Spire. The project offers a free loan of the artist – Arek Parasite’s skills. The usage of skills and the artist himself is intentionally limited to the imagination of the person who engages him, the artist limits his creativity to the articulated will of the user. The range of offered services includes i.a. following skills: artistic (easel and wall painting, workshop graphics, conceptual sculpture), professional (advertising graphics, artistic education, art workshops with different age groups [participants need to be at least 5 years old], experimental interior design), manual (redecorating, gardening), entertainment (movie screening, talking about art or coffee/drink companionship); as well as everyday activities (cleaning, cooking, shopping and other widely understood ways of helping in the household and with errands). The project is a part of The World Is Yours exhibition. The start of a promotional campaign is planned for the opening of exhibition and will last throughout December 2017. The realisation of selected tasks is to cover the next two months. The choice of activities that the artist will carry out will be done by an open call. At the finissage of the exhibition there will be a presentation summarizing the project.